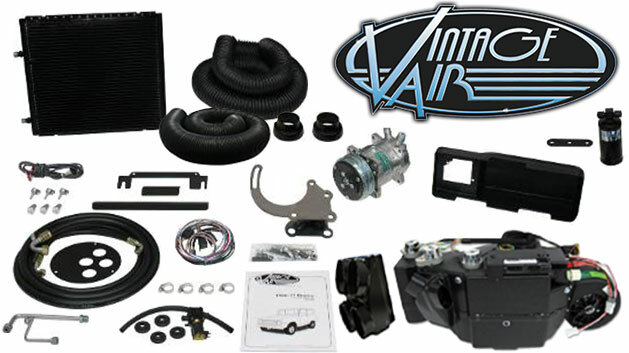 Gen IV Vintage Air Air Conditioning Kit for 66-77 Ford Broncos upgraded with a 4-vent plenum and moveable vents. This kit varies from our standard Vintage Air Conditioning Kit in that the hard plastic moulded a/c vent ducting that mounts under the dash has been replaced with a plenum and hose kit with 2 small vents and 1 double vent to allow for custom vent placement. This would be the ideal kit if you are looking to mount your vents in custom locations or install the vents into the dash. Like the other kit, this kit incorporates air conditioning, heater and dehumidified defrost into one unit. It's newly improved design offers better heating & cooling than past units. You must provide your own v-belt. You will use your factory defrost duct. We have these new as well. See Defrost Ductfor these parts. This a/c kit will require some modification to mount in your early Bronco. Please see the video below for details on the main modifications needed. Shipping is a flat rate of $129 for this item. Installation with Power Steering requires the #6326PS Vintage Air Custom Power Steering Bracket. Fits 66-77 Broncos. NOTES: Compressor mounts where top radiator hose should be, so you will need to route the radiator hose over the compressor. We recommend placing a protective sleeve over the hose where it will lie upon the compressor to keep the hose from being damaged. A/C kit comes with a new glovebox insert which is not as deep as the original to allow for clearance of the a/c kit. If you have a custom glove box, be prepared to make modifications for fitment. You also may need to trim the fan shroud in order to create clearance for the compressor. 351W installation may require additional modification.